Robert A. Copple, a Midwesterner who arrived in Los Angeles in the late 1910s by way of Oregon, appears to have been among those who arrived in the city attracted to the cachet of Wilshire Boulevard but misunderstanding how rapidly the volume of traffic along it would increase. Prosperous Angelenos established in older districts that were beginning to decline in fashion, such as West Adams, or even in slightly eastward, almost-new Wilshire corridor subdivisions whose rise in value was already causing them to be redeveloped into multi-family or commercial uses, flocked to new tracts in what was then called the West End, such as Windsor Square and Fremont Place. Windsor Square homebuilders generally shied away from lots fronting the boulevard, the evolution of which since its 1895 inception was showing signs that it wasn't going to last as a thoroughfare of grand single-family houses. For whatever reason, Copple—who had been a successful dry-goods merchant in Oregon and who was not, as some sources have conflated them, the same Robert A. Copple associated with a local hearse builder known as the Copple Auto Works—decided that Wilshire-adjacent Lot 39 of the Wilshire Square tract would be an agreeable homesite. After hiring the construction team of architect Robert D. Jones and contractor Sanson M. Cooper, who were prolific builders in Windsor Square just across the boulevard, Copple was issued building permits by the city on January 14, 1920, for a residence and garage at the southeast corner of Wilshire and Plymouth, oriented toward the latter. to this side of it within a few years. 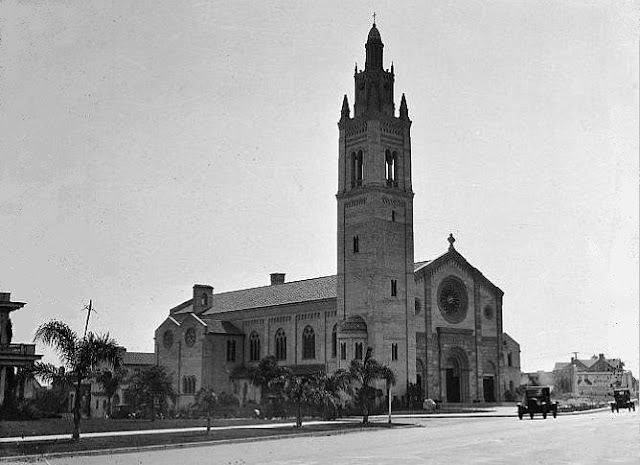 Whether Robert Copple and his wife Lalla and their son and daughter did grow tired of the din of traffic on Wilshire, or whether they were also put off by the announcement of the construction of the towering Wilshire Boulevard Congregational Church directly across Plymouth (opened in May 1925 and today the Wilshire United Methodist Church) is unclear, but the family decided to leave 700 South Plymouth in 1924. Advertisements appeared in the Times in February 1924 for an auction of their furnishings to be held in the house on the 27th of that month; it was noted in the ads that the house itself could be rented unfurnished for $300 a month. 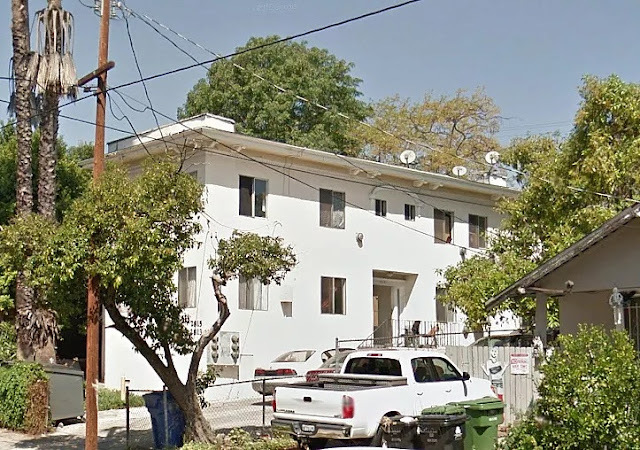 The Copples moved temporarily to a house on Berendo Street before moving to Hollywood; they appear to have retained the house on Plymouth Boulevard for rental even then, when another auction was held at 700, presumably for items not sold in 1924, on March 22, 1926. 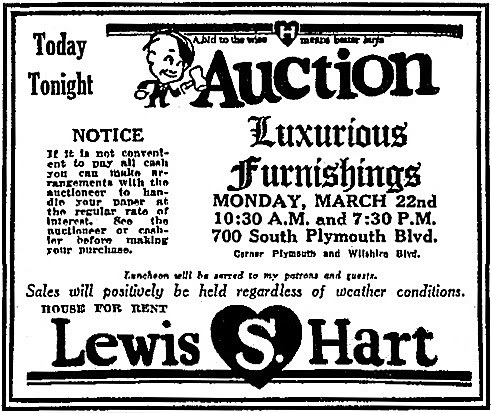 The ads for the 1926 auction also noted that the house could be rented. Los Angeles Times on March 22, 1926. 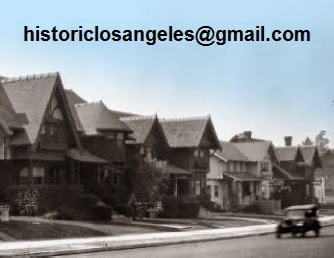 The gradual rezoning of Wilshire Boulevard from residential to commercial use had begun along its stretches from Westlake (now MacArthur) Park to Vermont Avenue in the early 1920s. While the road's path through the West End was thought by homebuilders to be safe from the invasion of trade (even if it was known not to be by wily real estate operators), the fact was that by Black Tuesday 1929 the Miracle Mile had taken increasingly formidable shape not far to the west, which would further seal the image of Wilshire as a boulevard of glamorous shopping rather than as any kind of linear residential neighborhood. The Copples may have considered that if their house was not to be viable as a long-term residence, the silver lining might be its increased value. Whether or not the family did retain ownership of 700 or by the end of the decade had sold it to another party is not clear, but as economic conditions worsened, the rental market for big houses in the area dried up. Some form of trade would have to pay the taxes instead. Enter Alexander Zukovsky, who opened a violin studio at 700 in the fall of 1931 and lived there as well. Zukovsky moved to Norton Avenue by 1936; by the time 700 South Plymouth was cleared from its corner the next year it had been acquired by a Frank T. Johnson. At this juncture, the "old" Copple house could have been expected to have joined the long parade to the graveyard of elaborate boulevard houses that had too-brief lives. The era of economics that had allowed for an alternative fate for some of them—relocation—had in all but a handful of cases ended with the onset of the Depression; it was thus somewhat of a miracle that 700 South Plymouth was granted a reprieve. While not so lucky as some relocated Wilshire district houses in that its move was not to a lot in a newer suburb where it might still sit shiny and respected today, it does still stand. 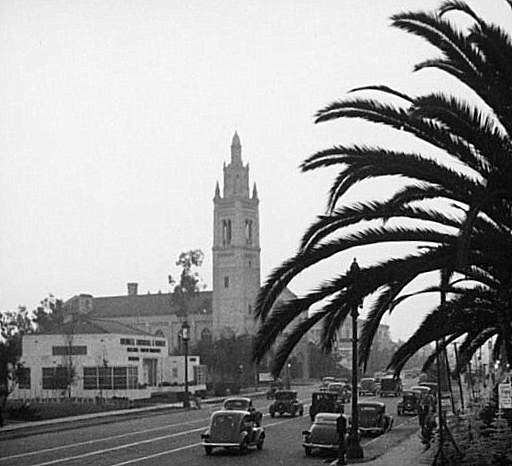 Moved in the opposite direction of most mobile Los Angeles residences, 700 wound up going east to a short street off Temple Street between Reno and Occidental Boulevard after the Department of Building and Safety issued a relocation permit on June 14, 1937. While the house's original garage was sold off separately and trucked to a lot at Ripple Street and Worthen Avenue a bit farther north—it appears to no longer stand—the Copple house was placed with its former Wilshire end to the street at 2815 Hyans Place, where it remains, few details other than its projecting cornice to hint at its former life in grander precincts. the corner of Wilshire and Plymouth boulevards. Most house relocations were in the opposite direction. 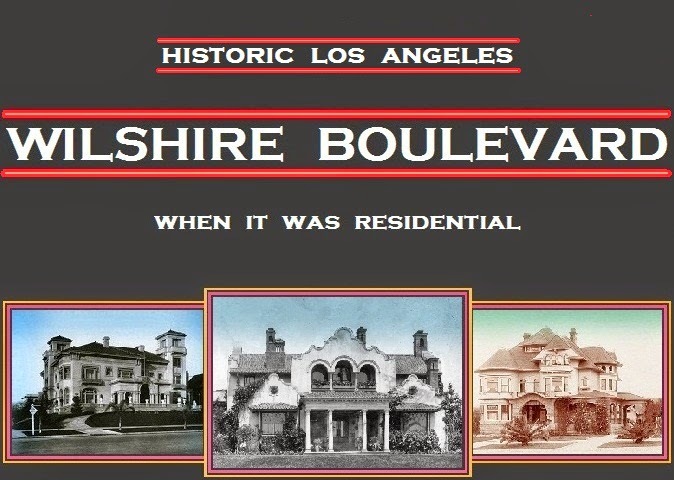 When Wilshire was extended to the emerging "West End" by the early 1910s, tract lots fronting the boulevard were at first considered as safe from commercialization and multi-unit housing as were the road's stretches closer to Westlake Park. After World War I, signs of change began to come quickly to the earlier linear neighborhood in the form of large houses being converted into boarding establishments and then into shops, tea parlors, and offices. Some homebuilders were not hearing the dog whistle of ambitious developers who were eyeing the entirety of Wilshire as the city's next great commercial boulevard, commissioning houses fronting the avenue as late as 1918 (4016 Wilshire, still standing, was built that year) and even 1920, when 700 South Plymouth went up. By then, prime lots in the West End were not on Wilshire but rather to the interior of tracts such as Windsor Square or behind gates, such as those of Fremont Place. By the mid '20s, what came to be called the "Park Mile" after the appellation "West End" became obsolete was given over to churches such as that of the congregationalists across Plymouth from the Copple house and clubs such as the Ebell, which opened in October 1927. Next door to the Ebell, the house at 4444 Wilshire, moved from Vermont Avenue in early 1925, quickly became a beauty establishment once the ladies began clubbing. 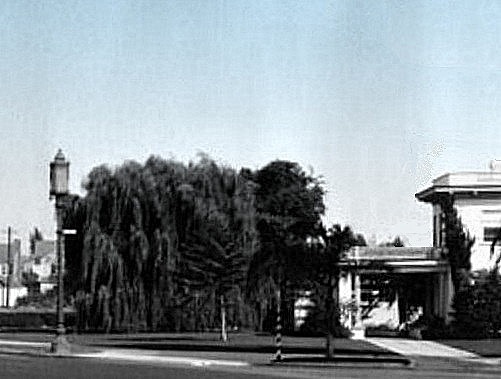 It was after the Copple house departed Wilshire for Hyans Place in 1937 that trade invaded the Park Mile in a big way with classic Los Angeles architecture of the period by designer Gordon B. Kaufmann. 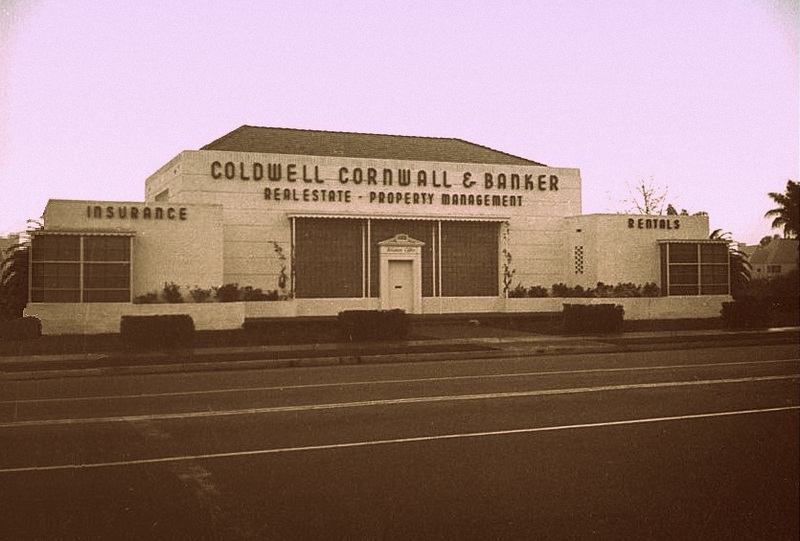 Occupying 700 South Plymouth's former Wilshire corner from 1937 to 1989 was Kaufmann's imposing central Los Angeles office for Coldwell, Cornwall & Banker, predecessor of today's national real estate firm with a somewhat shorter name. which A. W. Ross gave its start west of the West End in 1921.